Journey to ancient Egypt from the comfort of D.C.'s historic Folger Shakespeare Library, which will be transformed to present the play in-the-round. Directed by Robert Richmond (Othello, Timon of Athens, Henry V), Folger Theatre presents Antony and Cleopatra, the story of one of the most famous couples in history and their tempestuous, doomed love affair. They were two of the greatest lovers to ever walk the earth, but they were also political figures, and the pressures and the demands of their public life eventually tore them apart. 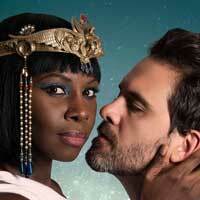 Cleopatra is one of Shakespeare's most complex female roles, all too human underneath the tragic grandeur. Allow the Queen of Egypt to rule your heart for an evening. "...This work from Shakespeare�s �Macbeth� and �King Lear� period doesn�t have the hurtling tension of those tragedies or the expansive spirit of the romances to come, and Richmond�s clear vision may simplify too much. Cody Nickell and Shirine Babb beautifully embody the powerful lovers in Mariah Hale�s fabulous and flattering costumes, and they command our attention as if by birthright. But they don�t often find tones between joy and anger. These unruly rulers swoon with lust or erupt into fits of pique. Like pleasure-saturated celebs, they wear their welcome out." "...The whip end of the doomed love affair between two of history�s most iconic figures, Shakespeare�s Antony and Cleopatra is an interesting animal. Not quite historical drama, not quite lover�s tragedy, it nevertheless has something for pretty much everyone: a lusty romance, arguing Romans, unloved wives, the suggestion of land and sea battles, and the awesomely creepy idea of suicide by viper. What�s not to love?" "...Not a minute of our lives should stretch without some pleasure in it. The Folger Theatre is stretching nearly two and a half very deliberate minutes of theatrical pleasure into their current production of Shakespeare�s Antony and Cleopatra. One of the Bard�s tragic histories, or historical tragedies as it straddles both categories soundly, this alluring and tempting production is an enticing start for the 2017/2018 theatrical season at The Folger. Directed by Robert Richmond, this production will titillate the eye and ear with striking visuals, intense performances, and an overall perfect recreation of a tragically historic moment frozen in time."